10 December 2018 (UN)* — Human Rights Day is observed every year on 10 December – the day the United Nations General Assembly adopted, in 1948, the Universal Declaration of Human Rights. Human rights are at the heart of the Sustainable Development Goals (SDGs), as in the absence of human dignity we cannot drive sustainable development. Human Rights are driven by progress on all SDGs, and the SDGs are driven by advancements on human rights. Find out how UN agencies strive to put human rights at the centre of their work. 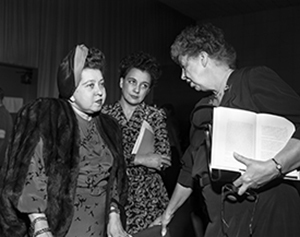 Eleanor Roosevelt’s leading role as Chairperson of the drafting committee of the Universal Declaration of Human Rights has been well documented. But other women also played essential parts in shaping the document. Learn more about some of them here. 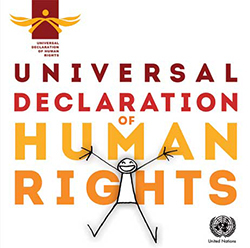 Record yourself reading an article of the declaration in your own language and team up with activists, authors and world leaders for human rights.